Today is National Coloring Book Day, and we’ve got an EPIK KETO//OS® coloring book to get your kids involved in the Ketone Conversation™! Coloring pages aren’t the only way to get kids involved, our kid-apprüved recipes are great too! 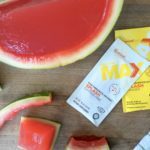 Using our fruity + citrus KETO//OS® Max Splash, we whipped up this super FUN watermelon gelatin creation! 1. Cut watermelon in half and scoop out the inside leaving about 1/2”. 2. Purée scooped out watermelon and strain for juice. 3. Place 4 cups cold water and unflavored gelatin in microwave safe bowl, let sit 1 minute. 4. Microwave 2-3 minutes until water is hot and gelatin is dissolved. 6. Add the 4 packs of KETO//OS® Splash Caffeine Free and whisk well. 7. Stir in 4 cups of the fresh watermelon juice. 8. Place watermelon on top of a slightly smaller bowl. 9. This will prevent the watermelon from tipping to the side. You know another GREAT way to get your kids involved in the Ketone Conversation™? Bring them to Kids Pursuing BETTER while you attend KetoKademy® + MORE this September!! KPB is focused on science based activities while you are attending Ketokademy®, and transitions to focus on enhancing leadership skills, confidence building activities, and team work while MORE is going on; KPB is about learning and growth just as much as it is about FUN, and tickets for it are 33% OFF today!! Get yours here!